Steve Mayles is a British game artist and animator formerly employed by Rareware, and the brother of Gregg Mayles. He was a character designer and sprite artist for the first two installments of the Donkey Kong Country series, where he created King K. Rool and Dixie Kong among other characters. He also worked on several other games by Rare, including the Banjo-Kazooie series, for which he designed, modeled, and animated the titular characters. 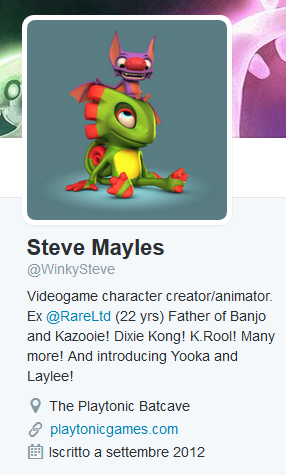 Mayles, along with several other Rare alumni, left Rare in September 2014 to found Playtonic Games, which successfully crowdfunded Yooka-Laylee on May 1, 2015. ↑ Kirkhope, Grant (September 30, 2014). Tweet by Grant Kirkhope about Steve Mayles departure. Twitter. Retrieved November 24, 2015. This page was last edited on February 25, 2019, at 02:40.